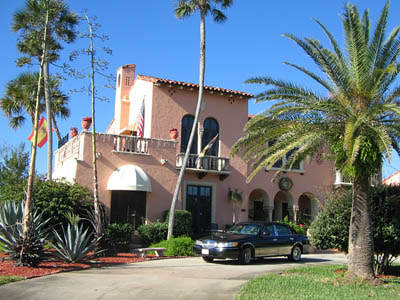 If you ever want to really live like real European Royalty but want to stay in the United States, then visit Daytona Beach, Florida and stay at the Villa Bed and Breakfast. The setting is a gated 1927 Mediterranean Villa on over 1 1/2 acres, with all the amenities. The grand host is James Camp and he certainly knows how to make every guest truly feel as though they really are Royalty. We stayed in the King Juan Carlos Suite which is very huge and has its own dressing room. 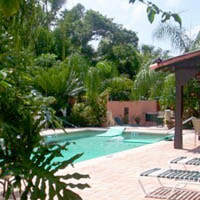 It is located on the second floor of the Villa and has its own patio with Jacuzzi and plenty of room for private sunning. Actually the private patio is about 18 by 24 feet! Isn’t that how all Royalty lives? The extensive landscaping includes a variety of tropical plants native to Florida, all of which have been enhanced with a circular driveway and beautifully decorative fencing and entry gates. The Villa was built by B. J. Donnelly, a wealthy gentleman from Massachusetts. He spent only 5 winters in the Villa, traveling from his northern mansion with his chauffeur in his Pierce-Arrow limousine, accompanied by his two maids, staying only for the two months of January and February until his death in 1935. 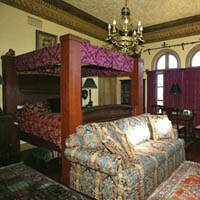 The original owner monograms can be seen in a cartouche above the front door and over the master bedroom arched windows. There is also a servants quarters as well as a nice apartment above the garage for the chauffeur. A walk thru the Villa is a treat itself which is full of beautiful antique treasures gathered from all over the world. A huge collection of porcelain, cut glass, tapestries, oil paintings and fine furniture abounds the Villa. The Villa is just steps away from the world famous beach, where you can drive on the beach, swim in the ocean, ride the surf, parasail, take a boat ride or just relax. Actually one could just stay there for a month and never leave the grounds. A large swimming pool is perfect for guests. Let’s see?……. one could either “motel” it or…. Stay at this Grand Villa! Glad that we opted for the Villa. The owner, James Camp has owned the Villa since the 1992. James Camp used to own a guest house bed and breakfast in Key West for several years before purchasing the Villa. James is a VERY gracious host. However you do need to get out once in a while, so head downtown to the Halifax Historical Museum which is located in the historic former Merchant’s Bank Building at 252 South Beach Street in downtown Daytona Beach.. Their website is: www.halifaxhistorical.org. The Halifax Historical Society was founded in 1949. The mission of the Society is to gather and preserve the history of the Halifax river area and present it to the public in an interesting and educational manner. 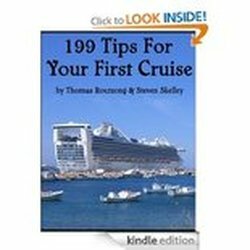 Start off with a very informative 20 minute movie to introduce you to the area and then your ready to take in the sights of the museum. Fay LeVeille is the Director and she is doing a remarkable job. Daytona Beach is of course famous for their beaches where you can drive your auto right on the beach if you want. We declined. We have seen way too many tow trucks on the beach towing away autos that got stuck in the sand and the cost is quite expensive.